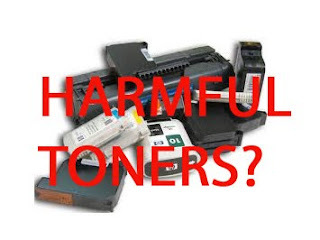 Is A Laser Toner Cartridge Harmful Or Not? | TonerGreen - Eco-Friendly Toners from the U.S.
Is A Laser Toner Cartridge Harmful Or Not? There are times when you might be thinking about whether or not your laser printer and its laser toner cartridges are harmful to you, especially if you refill your printer supplies more often than usual. Although there haven't been facts to prove that a laser toner can be a risk to your health, it would still be best for you to know some of the information about how it can cause you trouble with your printing and savings too. Like any other machine or appliance in your home, your printer and its supplies also need maintenance and care. If you do not properly clean them, you might run into problems with your printer and toners. Just consider this, the laser drum cartridge can actually give out gaseous waste, toner, and dust when it reaches a critical temperature. Also, when you do not properly clean this part, it could create faulty electric problems in your printer. As for the laser toner cartridge, there could be a harmful substance in it if you do not go for a trusted printer supply store. It is actually called “carbon black,” which is normally used for monochrome laser printers. This contains iron oxide and carbon which can be hazardous to your health if precautionary measures are not taken. So to be sure that you don’t encounter any problems, whether in health or in printing, go for trusted printer supplies stores. When it comes to third party supplies like remanufactured toners, there are still great ones like TonerGreen that can provide high quality printing, huge savings, and eco-friendly living.